Leaving Orléans we had a lovely few days cycling along the stopbanks of the Loire. The birdlife is incredible, and especially so first thing in the morning and at dusk when you have the cycle paths to yourselves and share the light with the herons, egrets, kingfishers, ducks and swans. We had planned to have a rest day every 7 days or so, and now on day 8 we were both in need of a break and planned to find a gîte in Giens. 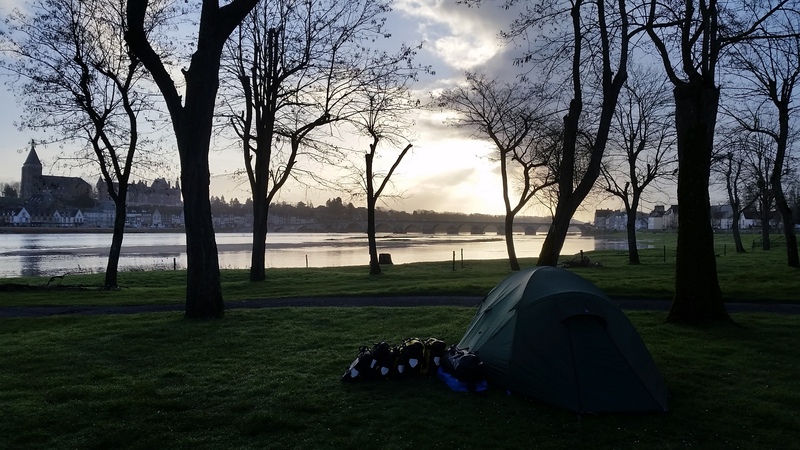 Even better we found our first open campsite, situated right on the bank of the Loire with a stunning view across to the city of Gien. After washing ourselves and our clothes we headed into explore Gien, finding yet another incredible bakery - Le Fournil de Gien - just before the storm clouds rolled in and we took cover in the beautiful 15th century Château de Gien. 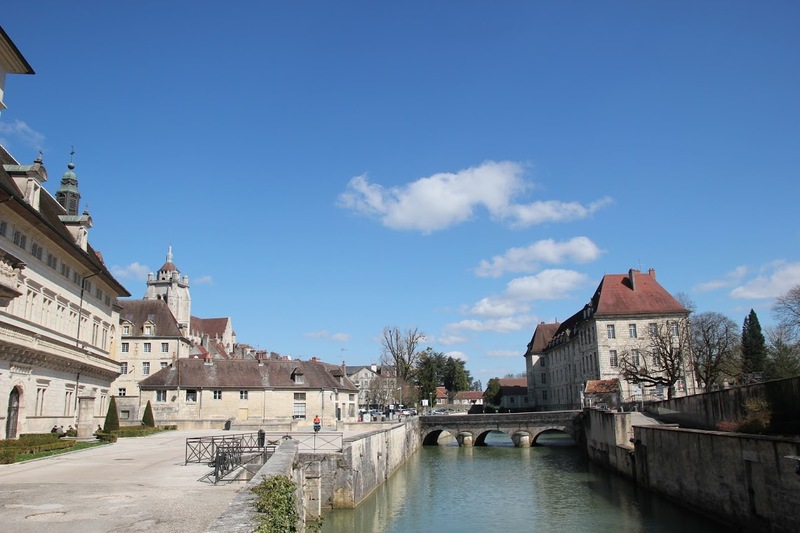 The city was heavily bombed by Germans in the second World War with a million soldiers and refugees trying to cross the bridge into Giens over just a few days before it was destroyed. The Château, home to Kings and Queens is now a hunting museum and has been fantastcially curated so that even non-French speakers can enjoy the many historical artefacts, drawings and cinematography. The museum highlights the fascination of hunting for sport and had some pretty gruesome paintings, but the most interesting displays were on the use of falcons for hunting, now used for conservation. We’d cycled past many woodlands with signs up saying ‘Réserve de Chasse’ which means ‘no hunting’ so the museum was a timely reminder of how times have changed. Rested we continued into strong headwinds up the Loire valley, but beautiful sunshine - you can’t have it all!! Our path left the river at times to run alongside the peaceful joining canals. Riding past Sancere we were tempted by the many vineyards but time was not on our side so we pressed on along the Canal de Nivernais. 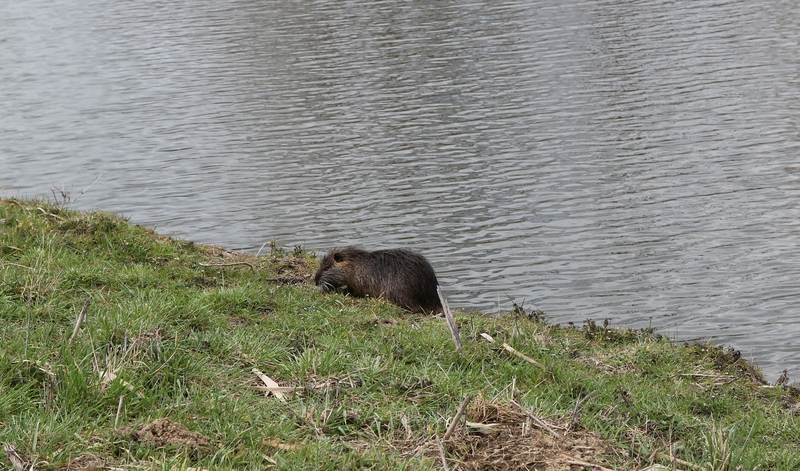 Our reward however, seeing otters and beavers duck in and outof the water beside us, just magical! We had been warned that cold weather was coming but were not quite prepared for max temperatures of 3 degrees and suffered a bit of the next few days. After camping in the snow we met our first other long distance cycle tourists! 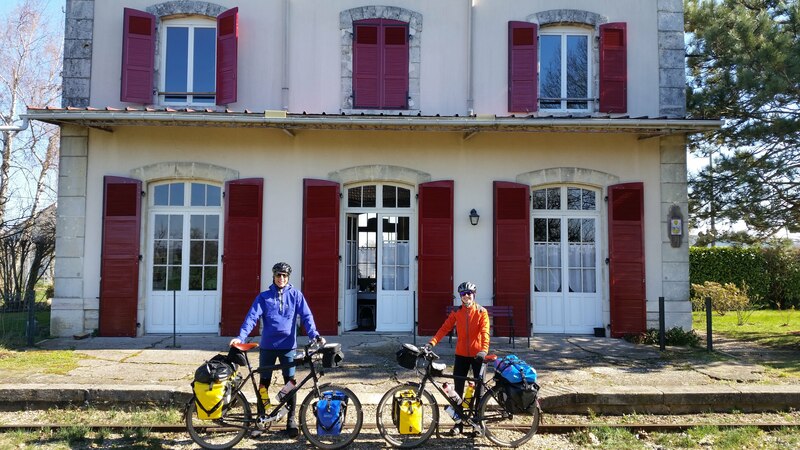 A great boost we had a good chat in Frenglish about the cold and accommodation difficulties of cycling off season. 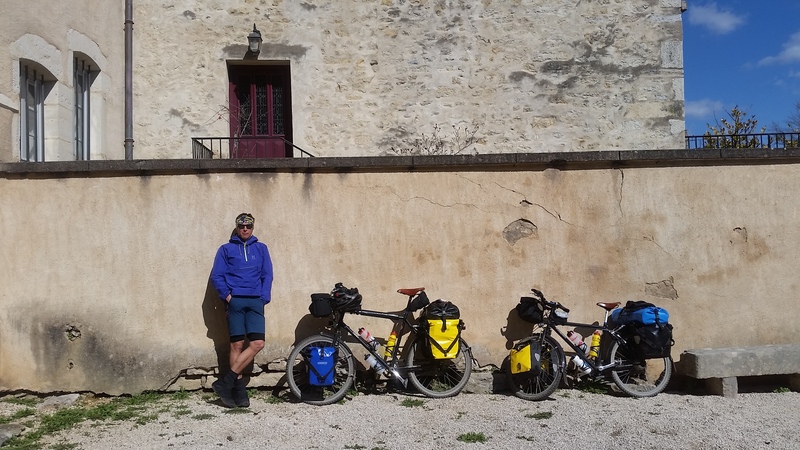 Mateo & Sonia are a French couple cycling from France to Bangkok - we hope to meet them again further along our route! Needing to warm-up and tempted by a short-cut from our planned route we headed up into the hills. Beautiful views over the Morvan hills and good training for Switzerland! The following day we almost did more walking than cycling! First pushing up a steep farm track (great JR shortcut! 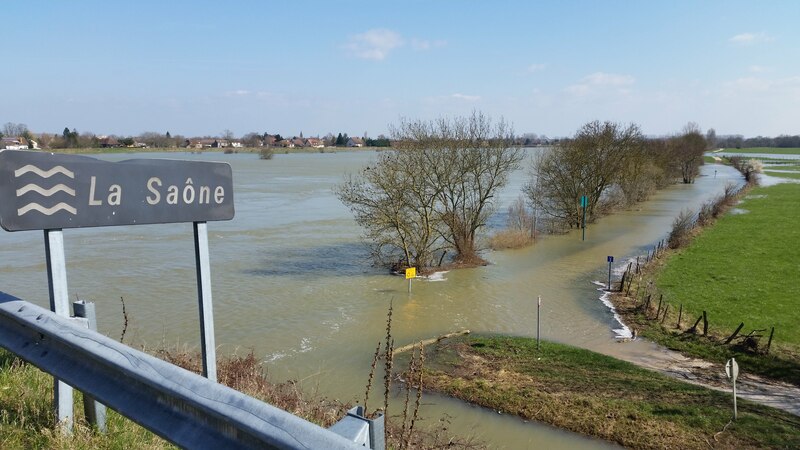 ), then along the stopbanks of the ‘Voire Bleu’ past Chalon-sur-Saône, then such slow going through flat farm after farm into a strong headwind that we may as well have walked! Luckily we had a Warmshowers to look forward to, and what an incredible experience! Our hosts live in an old train station and you could still see the layout of the ticket office and entrance halls etc. Incredible house, incredible people, we wished we could have stayed longer and that our French was better!! 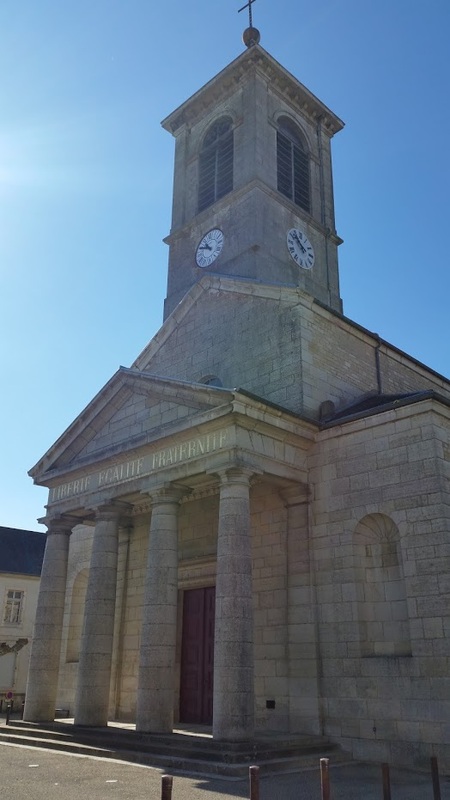 As we finally left in the sunshine the next morning we rode past Saint Aubin’s church - one of only three in France to have the motto ‘Liberté, egalité, fraternité’ etched on the front, a contentious issue for some as ‘fraternité’ used to signify Christian brotherhood but is largely now accepted as meaning solidarity without religious connotations. 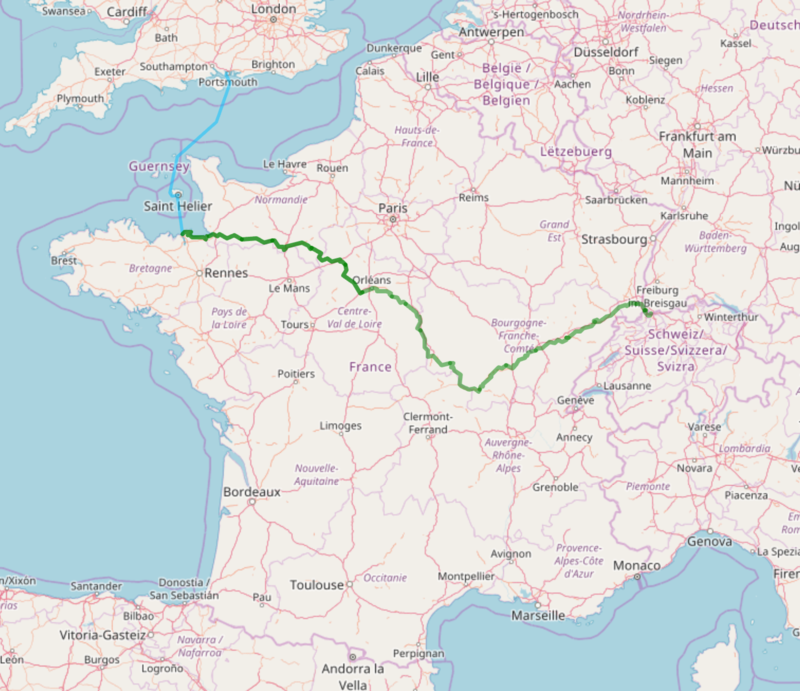 The ride to and from Dole is stunning, between the river Doubs and interconnecting canals. Dole is the birthplace of Louis Pasteur, the famous French scientist who discovered a vaccine for rabies and developed the concept of pasteurisation, through studying the fermentation of wine - much more important than milk!! The sun came out as we munched on baguette number 35 and all seemed well. The following day we met our second long distance cyclist, Eternallifenow (no that’s not a typo). 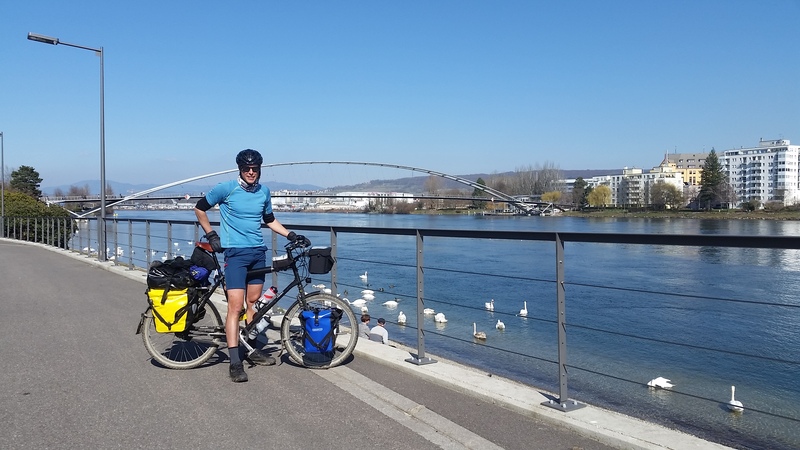 He is cycling from Salzburg Austria to the Mediterranean coast where he is going to build a raft and sail to Ibiza - he’s done it before apparently!! 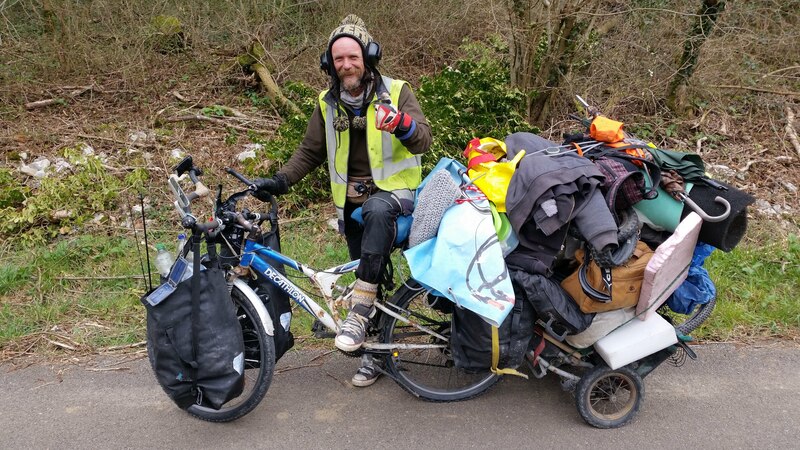 He had everything he owned on his bike (a cheap Decathlon mountain bike) and cycles whilst listening to philosophy. You have to admire people like him, seemingly not a care in the world, he has no affiliations, no home nation and is trying to rid himself of life’s inevitable prejudices. We were blown away with the generosity of people we met on this trip and especially through Warmshowers on the last two days in France. Bad planning, closed campsites and panic and nightfall in an urbanised area near Besançon led us to call a Warmshowers host at very late notice. They took us in like family and even left us some feet warmers to cycle in the next day as we had told them how cold we had been! So incredibly touched. Our last hosts in France were equally as kind, getting up early especially to buy croissants for us and keep the croissant count up!! We could have spent the whole weekend with them, and were tempted as it was proving difficult to find acommodation in Basel. 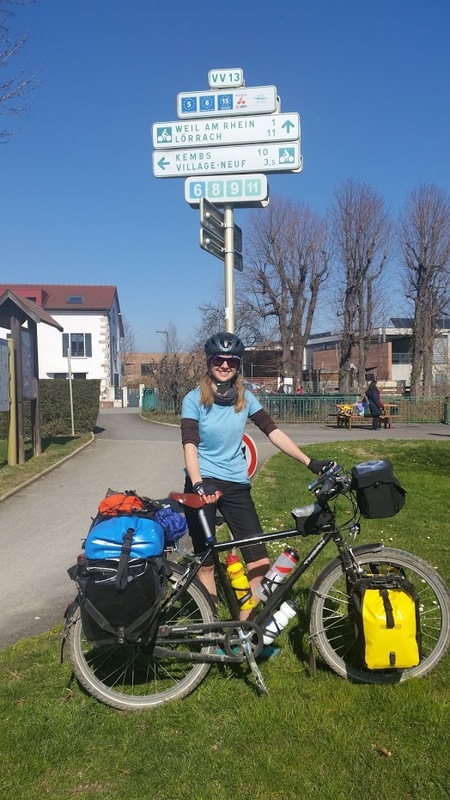 However, a warm and sunny day lured us back on the bikes as we followed the canal into Basel, said goodbye to Euro Velo 6, and crossed over the three countries bridge (France, Germany, Switzerland).